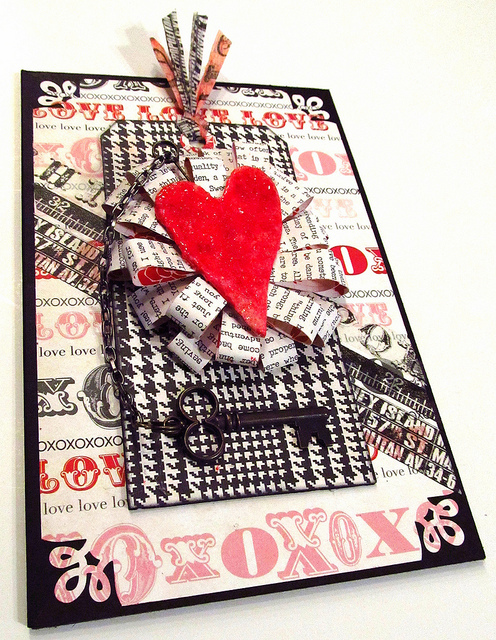 The Gentleman Crafter: Valentine Cards! First, let me thank you all for purchasing the Monthly Idea Organizer Tutorial. You guys rock! I hope you enjoy making it and find it useful. I so appreciate your support! OK, Now...I guess it's time to get started on Valentine Cards. I'm probably a little late, but I have a few Valentine's Day projects I wanted to get through before the actual day! LOL! Warning: It's a full hour so... either grab your favorite beverage or skip it....LOL! 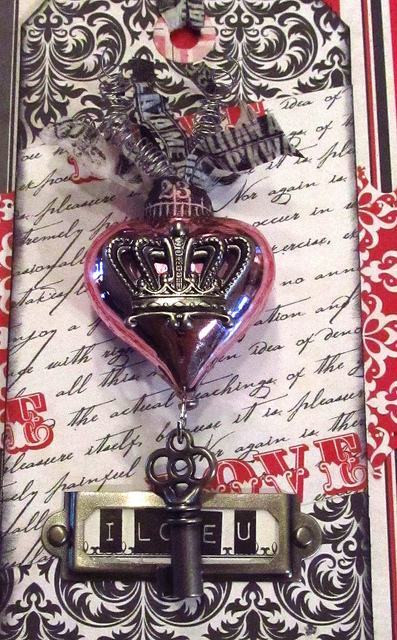 Better get back to the studio...Working on a tutorial for the 10 Things I love About You Heart I did last year and a new 3-D heart thing....Hehehehe! Gorgeous! I love that striped paper! Both are striking and gorgeous! love the fact that you use black for valentines... not many people do. I love black on anything. I think it makes things POP! Glad you like it! Oh my flippin word Jim, how cool are these two little tokens of love. Any girl/guy would love to have one of them. I'm in the Valentines mood this year too so far three projects done and three on the go. Yay Sue! You are ahead of me! I better get crackin'! Thanks for the kind words! I really like the black too. Beautiful cards - frameable. How did you get a jump ring through a glass heart or is it solid? I'm not jumping in until I see the 3-D heart. Not after that he-he-he. Hey Mo! How are ya? What I did was I opened up a silver brad and put the jumpring in the middle and molded (bent) the brad legs to the heart. I then hot glued it to the glass tip and added the key. Completely fabulous...both cards! Love what you did with the heart ornament! Can't wait to see what's next!!! Thank you Donna! Appreciate it! I am so glad I watched the videos because the heart didn't photograph very well. In the video the shine, sparkle, and glitz show up and the heart is beautiful. In the picture I thought it was very rustic but it is truly the exact opposite. I never thought to make the card with chipboard and lining the inside like this- a terrific Idea. It really elevates the card into the work of art a pretty, well-done handmade card is. You are so right Danee. Even the video doesn't do it justice. I'm tellin' ya this think sparkles like a ruby. There is nothing better than glitter glass in UTEE. Thanks Kay! You Rock my friend! Jim, I just finished watching your video's and first of all let me tell you I was not bored at all. You are very entertaining, it would be boring if you didn't chit-chat, so quit apologizing. You made my afternoon, I sent my daughter off on an airplane this morning to go thru some testing for a government internship. She's such a strong kid, but Mom is a wimp. To make a long story short, she was scared and we both started crying, so I spent most of the day boo-whoing. (by the way, my kid, is 19 yrs. old) Anyway you brought me out of my funk and I thank you for that. 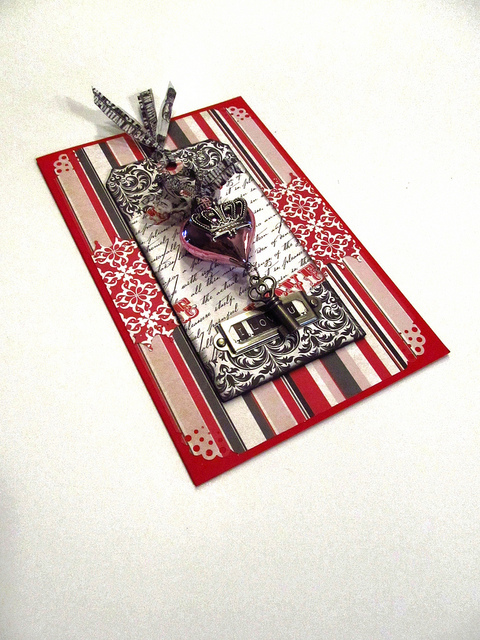 I'm going to go to my crafty area and try to re-create your card with the supplies I have. To finish the story, HA, she arrived safely and now I can relax for the night. You raise them and it's just so hard letting go!! (now let me apologize for boring you, but thanks again. Your cards are just beautiful, I love the black white and red together. Thanks Tons Mark! It truly is my pleasure! Thanks for coming by! Loved the videos, so entertaining. 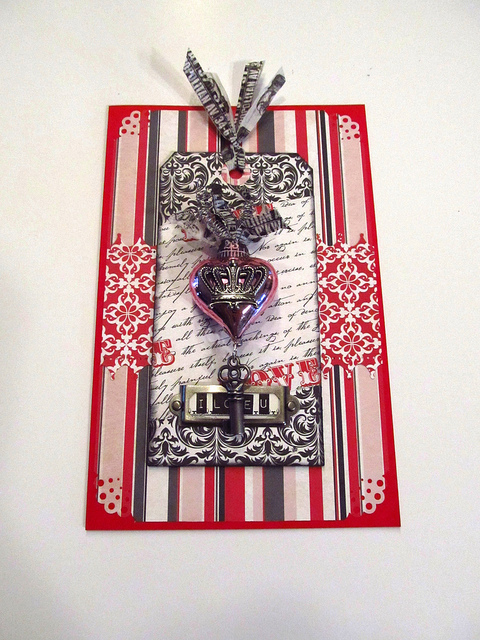 Spectacular card, and love the combination of red, white & black. Last Valentine's card I made was the same color combination.! ....ohhh Jim-Doodle.. what you do is perfection.. thanks for all you design and for the entertaining You-tube creations.. I hope you never tire of this..Have a wonderful week !!! I'm assuming you liked it! 7 times even! Bahahaha! Thank you so mcuh! I appreciate your kind words! How sweet! Thank you so much for watching! It was ling huh? So glad you liked them. So appreciate you! What striking cards! Your eye for color and pattern is fabulous. I'm glad you are back in the studio too! Hope your week ahead is a great one. Hugs. Hiya Sharon! How are you? So glad you came by! You are so sweet...always are. I appreciate you more than you will ever know! Thank you, you too have an awesome week! So glad I discovered your blog and watched your video. Your card is awesome - love the way you talk through your creative process and dig for treasure. Can't wait to explore more of your blog. Thank you for sharing your talent and passion! I don't even like Valentine's Day and I'm inspired. Awesome cards Jim! OOOO lots of inspiration...like how you used the punches around the edges...humm... gives me an idea for some papers I did not like a whole lot...alters the look!! Dang it! I should have checked here before I spent all day fiddling with my Valentines. All two of them. Love the first one with the heart ornament so clever. You reminded me - I have that corner punch. It looks cute when you use it, am I surprised? Well, now I have something to work on tomorrow. Oh Jim. You make the most gorgeous things. I wish my creative muse were as active as yours. I am delighted with you, Jim! Your works are very very beautiful! I really can not get enough of your great works, a few days ago, i spent a whole night in front of computers and looked at your blog and your youtube videos, and suddenly would be 4 clock in the morning and at 5:30 I had to leave the house... anyway ... I have lots of ideas "copied" from you, and I will try to do after! I hope I will soon hear from you, I would be very happy! Sorry, but I'm not so good in english, I have translated to Uncle Google :-)! All the best to you and still many creative ideas!! Be well and God bless you! Oh my, what wonderful Valentines! I was going to watch the videos last night but the my version of your Organizer kept calling to me...so close to being finished. So...this morning I spent an hour with you and enjoyed both videos...just like being there with you. I love, LOVE the glitter glass & UTEE technique...gotta get some glitter glass next time I go to Waxahachie. Both cards are wonderful! I've really got to get some made this week...thanks for the inspiration!! Yep, going to copycat that one. Especially the paper strips around the heart. Very cool. It is very generous of you to put the videos on here. Thanks! Jim: Your Valentine's are so beautfiul! Love your video. It's way better than anything on TV. Love your work - can't wait for more. The binding rings come from Tim Holtz. Thanks Jim, I swear I'm not a stalker..lol......somehow I messed up a few of the messages and they kept coming back....I guess I need more computer training from my granddaughter...ha ha ha. I so much appreciate you taking time out to send not one message but two. As I've said I truly love your work and G 45 paper! I'm sorry you are no longer on their design team but know you will still have fab ideas to share! I'm kind of new at this but I use my tablet daily to get ideas. Thanks again you are truly The Gentleman Crafter. Your biggest fan. Fran B. Awesome creations! I always look forward to coming and seeing what you are up to! I will watch your video later, as I am off to work! Hope you have a wonderful week!!! I know this doesn't belong here, but I know there are a lot Tim followers on here(that's how most of us got here). Has anyone tried to get on his blog this morning only to be sent to Twitter? I don't want to Twitter, I'm old and can barely get off the ground. Awesome video... watched it last night! It's really nice to know that you are REAL in your video's, like a regular crafter... not fake... like it is staged or you are reading from a script! I really enjoyed your video and me thinks I need a Xyron machine now! LOL!!! Have a wonderful Sunday and hope it is very creative!!! Watched your video last night and made this http://krikeykreations.blogspot.com/2013/02/birthday-flowers.html today! Thanks for the inspiration. You got a new friend and fan -.. will follow you.